The Women's Resource Center is now offering a comprehensive/intensive certificate training program on sexual violence called, The Brave Project. We want to envision a campus community that is free from violence. Anyone (faculty, students, and staff) in the SDSU community is invited to participate. Please note, that to complete the certificate program, you must attend sessions 1-4 in their entirety. Each session is offered twice- pick the dates that work for you! Details on each session, their dates, and times are listed below. The Women's Resource Center is able to offer this training free of charge participants, but there are significant costs in time, energy, and resources devoted to facilitating the Brave Project. Please respect these investments by making a firm commitment to attend and complete the program when you register. 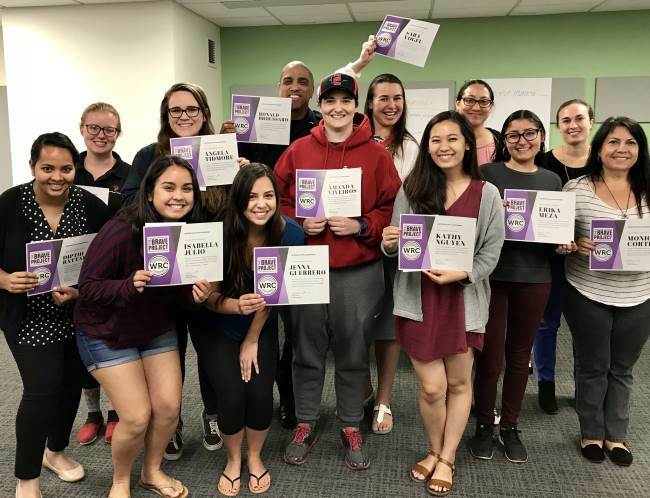 For more information on the resources and reporting options available at San Diego State University, please visit our comprehensive Title IX website.